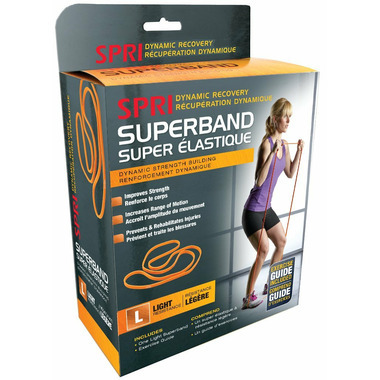 This sturdy, strong SPRI Dynamic Recover Superband is an ideal tool for injury recovery and therapeutic strength building, from improving range of motion and lengthening muscles to preventing and rehabilitating sprained ankles. One of the most versatile conditioning tools available, this Superband can be used for walks, squats, lunges, presses and more to improve total body strength and increase blood flow to prevent injuries and improve recovery time. This Superband can also be used to provide body weight assistance for exercises like pull-ups and dips.